Rules of Golf: What May You Remove from a Bunker/Water Hazard? This subject is an easy one, but surprisingly it catches out many amateur golfers, who incur unnecessary penalties as a result. It is essential that you are able to distinguish between obstructions, which are artificial objects, and loose impediments, which are natural objects, especially when your ball lies in a bunker or water hazard. 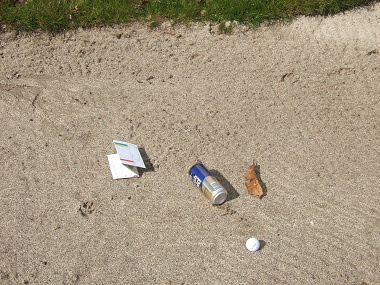 Loose impediments are natural objects that are not fixed or growing, not solidly embedded and not adhering to your ball. If a player’s ball lies in a hazard, the player must not touch or move any loose impediment lying in or touching the same hazard, Rule 13-4c. Stones (but see *), leaves, branches and twigs, pine cones, dung and droppings, insects, worms and their casts, spiders and their webs, half-eaten fruit, fruit skins, ant hills, dead birds and animals, aeration plugs, clods of earth, gravel, crushed shells, wood chips. * Note that whilst the Rules do not permit players to remove stones from bunkers, that is often overridden by a Local Rule that does permit their removal for safety reasons. Obstructions, providing they are easily movable (and are not out of bounds stakes), may be removed from anywhere on the course, which obviously includes bunkers and water hazards. Remember, if it is natural it is a loose impediment and if it is artificial it is an obstruction. Don’t be tempted to remove that leaf or twig lying close to your ball in a hazard. Here is a low-cost Christmas present idea that does not need to be wrapped, posted or hand-delivered. My eBook ‘999 Updated Questions on the Rules of Golf 2012 – 2015’ can be purchased on-line at my web site www.RhodesRulesSchool.com. On the same day, I will send to your email address (or the recipient’s, if it is a gift) two files; a .pdf file for reading and printing out from any computer or laptop, and a Mobipocket file for transferring to any eReader, tablet or smart phone. Click here for details.